SPRAY-ON computers the size of a grain of sand are set to transform information technology across the world thanks to pioneering research at Edinburgh University. Scientists at the institution have just been awarded a 1.3 million grant to develop the "ubiquitous computing" technology which uses tiny semiconductor specks that can sense, compute and communicate without wires. 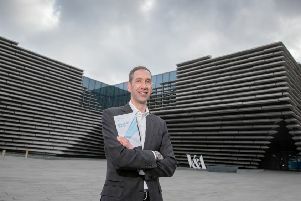 The study is set to put Scotland at the forefront of the next great leap forward for information technology and is likely to bring huge advances in all walks of life. Researchers are already working with staff at Edinburgh hospitals to develop a method of using the computers to monitor heart patients at home. They plan to spray the nano computers on to the chests of coronary patients, where the tiny cells would record a patient’s health and transmit information back to a hospital computer. Head of the project Professor DK Arvid said: "This research is very much looking to the future. At the moment, computer information is processed very discreetly, you either have a laptop, or a PC. "In the future, computers will be able to be diffused into the environment. There won’t be a sharp division - barricades will just disappear into the background. "One way to achieve that will be computers the size of a grain of sand. Just by spraying them on to objects, you can computerise them. They would create a network which can transmit wirelessly to each other. "In a cubic millimetre, you can have a sensor for heat, pressure, light and so on, but also a computer and wireless technology. The professor said the team was already involved with doctors at the Edinburgh Royal Infirmary and the Western General Hospital. He said: "We are already working with cardiologists on a spray which would go on the chest and monitor the performance of the heart in an unobtrusive way. It means you don’t have to have a large machine to lug around or go into hospital. "After surgery there is great pressure on hospital beds yet there is no reason to stay other than to keep hooked up to a machine. "With this you get into the home - this research is going to have an impact on real life." The funding for the project, which also involves Napier, St Andrews, Glasgow and Strathclyde universities, has come from the Scottish Higher Education Funding Council. The money will allow the scientists to see the technology working within four years. Prof Arvid said the spray-on computers could be in shops, hospitals and schools within ten years. "At the moment if you want to interface you have to use a key board or a mouse, which is very unwieldy. With this you could take a pen and spray it and it becomes an interface in its own right." The advance is set to put Edinburgh and Scotland at the forefront of the industry. Bill Furness of Edinburgh Chamber of Commerce said: "This has huge potential for applications in commerce, health and education. "From the business community’s point of view, we are increasingly looking at the future of our city. "Part of the answer to that is the vision of a world-class centre for research and innovation. "This particular development sounds a very strong building block towards that vision." Dr Simon Maxwell, part of the blood pressure unit at the Western General Hospital in Edinburgh University’s department of medicine, described the technology as very "exciting". He said: "This will allow us to monitor patients much more accurately than we have ever been able to do and for more prolonged periods."